If you would like to sign up to use the Elementary Computer Lab or the MAC Mobile Lab.... look no further! Where are the calendars located? The calendars are on the left hand side of the page. You should find them under "Other Calendars". * If you think you should be able to view/use a calendar that you are not currently able to view, please email me. Make sure the calendar is darkened in the color. If it is white with the name of the calendar in the color, you are not currently viewing the calendar. Click on the calendar so that it goes white. You will still be able to see the name of the calendars you are a part of, but it is live and you can view it when it is dark. 1. Click on "Create an event" in the upper left hand corner of the page. 2. 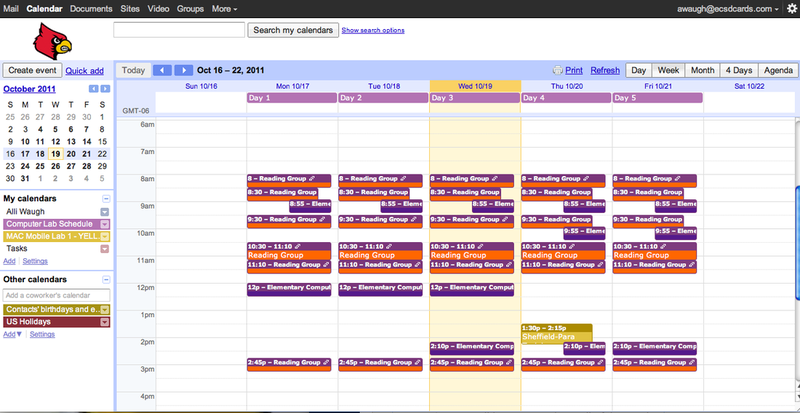 You can double click on the calendar in the spot you want to add an event. What: Please enter your Name and Class or Grade. Due to how the calendars are set up, the calendar is which item you are signing up for. Please be careful in checking what items you are signing up for. It is easy to delete items that are not yours. Please be careful. Hope this is helpful! If not, you can always ask me if you are still unsure!